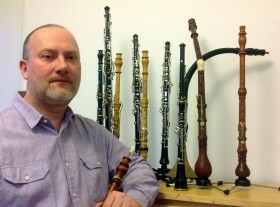 Peter Tabori was born in Novi Sad/ Jugoslavie (now Serbia) where he started his oboe lessons with Zsuzsana Egi? and Ljubiša Petruševski. Peter Tabori had followed studies of oboe in such institutions as the Franz Liszt Academy (Hungary) and Koninklijk Conservatorium (Royal Conservatory) in The Hague , Netherlands. Among his teachers and tutors were Bart Schneemann, Remco de Vries, Frank de Bruine and Ku Ebbinge. In The Hague he had earned his Master degree on the Classical Department with modern oboe and on the Early Music Department with historical oboes as well. As a soloist, chamber- and orchestra musician Peter has performed in Netherlands , Sweden, Norway, Finland, Estonia, Poland, Island, Spain, Portugal, France, Italy, Russia, Hungary, Switzeland, Germany, Austria, Cyprus, Georgia, Canada, Australia and United Kingdom. He had also taken part in many cd recordings. As orchestra musician, Peter often plays or has played with Musica ad Rhenum (NL), Orchestra of the 18th Century (NL), New Dutch Academy (NL), Apollo Ensemble (NL), Musicien de Louvre-Grenoble (FR), Academy od Ancient Music (GB), Concerto Köln (D), Balthasar Neumann Ensemble (D) , Das Neue Orchester (D), B’rock (B), Les Muffatti (B), Haydn Sinfonietta Wien (A), Wiener Akademie (A), Orfeo – Budapest (HU), Australian Chamber Orchestra (AU), Tallin Baroque Orchestra (EST), Wroclav Baroque Orchestra (PL), Musica Eterna (RU), Helsinki Baroque (F) and L’arte del Mondo (D). Among the conductors he has perfromed with are Frans Bru?ggen, Thomas Hengelbrock, Peter Neumann, Hermann Max, Ivor Bolton, György Vashegyi, Richard Eggar, Ton Kopmann, Werner Erhardt, Martin Haselböck, Mark Minkowski, Skip Sempé, Kent Nagano, Reinhard Göbel and Yevgenij Svetlanov. Peter Tabori has been giving masterclasses on the Franz Liszt Academy of Music in Budapest and has been teaching on the Apollo Summer Academy (Netherlands).